My other 'airport purchase' whilst at LGW, was this Soap & Glory gift set. I looooooove Soap & Glory! Actually, I think most of us girls do! For me, Soap & Glory gift products are always a must for Birthdays and at Christmas time. So hubs treated me to this Pamper Gift set (find it here) as an early Christmas present, lucky me! I've been good so far and have not used any of the products, but I have dipped into the body scrub, as my skin was well overdue for a good 'ol scrub! Actually, the only reason we popped into Boots was to pick up a body scrub for moi and I came out with the whole set! I chose this particular one, as I have used all the products before and love them all (I haven't tried the heel cream before, but I'm confident I'm going to love it as much as the others and looking forward to trying it out!) I knew every product would get used. Don't you find that sometimes in the Christmas gift sets, there's always a few products that are never opened and end up being flung to the back of the drawer?! Not this time!! The wash bag everything comes in is a really good size, perfect for future trips away! 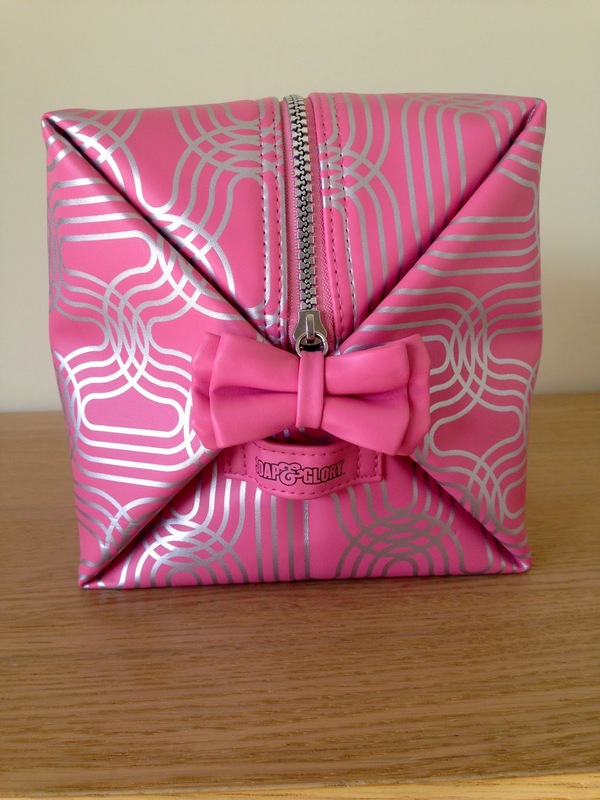 All the products are neatly inside the bag wrapped up in pink and black striped tissue paper. The set is £18 and of course is included in Boots famous 3 for 2 mix and match promotion!! Soap & Glory is the best! Great value really and the bag is really cute and a good size too!! Yup THE best. Lucky girl you. You're right aswell about there always being an item or two that you don't like in a gift set but never with Soap & Glory. Let it be known I am a massive fan of S&G, and you too!!! !